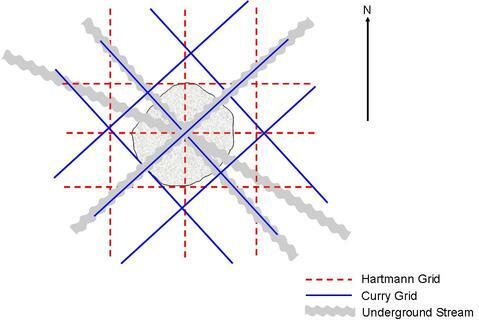 Not all earth energy is good for us, there are two grids that cover our planet, the Hartmann Grid & The Curry Grid. The Curry Grid runs North West to South East and can be detrimental to our health at negative crossing points when they are over a blind spring, this is known as geopathic stress. The Hartmann grid travels from North to South and East to West. 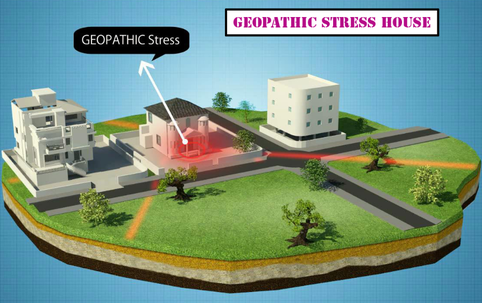 If you see the diagram below you will be able to see the exact point where geopathic stress occurs. You can look for these spots within your own environment by asking your rods to show you North West and then walk in that direction until they show you a curry grid crossing point, it is at this point you can ask your rods if this point is positive or negative. You can then continue forward to search again, they are around 3.5 metres apart. You will also need to dowse for underground blind springs., as the stress is amplified at this point. If your home suffers from an area of stress at the crossing points you can resolve this by moving your furniture as it is detrimental to health to sit in one spot over a stress area, or to have your bed in this area. You can place copper pipes outside of your home to defer the energy so it does not enter, similarly you can do the same in your garden. Or you can place crystals or heal the areas with crystals. If we think about the sun,in summer if we sit out for more than an hour we will probably burn, if we were to sit for more than 8 hours we would definitely burn quite badly. This is the same for the radiation from the energy lines that we cannot see. It is only the negative crossing points of the curry grid that are over a blind spring that will cause a problem for us. Lots of research has been done into this area, In Germany house buyers get a certificate to say the house is free from geopathic stress. In Austria planning permission will not be granted unless the plot is free from stress free zones. There is a lot of research out there to prove this, making our homes free from earth energy stress is relatively simple to do and yet we do not seem to be educated about this.